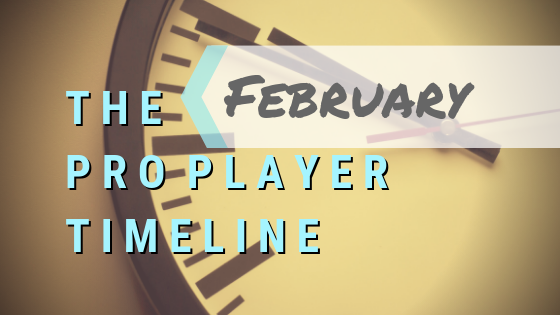 Working from The Pro Player Timeline: Overview, this individual month post focuses on what a professional player overseas - or an aspiring pro player - should be outlining each specific month of the year like. Navigating Sports Abroad blog post. Play Abroad 101 for the most accurate preparation in print. & The Pro Player Timeline: Weekly. Most players looking to play professionally overseas don't really have any idea how to do it! This is not your fault; unless you know someone who has done it or have incredible connections already in the pro world of your sport - you try searching Google and barely anything comes up. A few agencies, some club team pages, maybe an incomplete Wikipedia page about a league or two. Pro sports are cyclical. What might be a frenzy of hiring in August right before the season starts can occur again in January at mid-season transfer periods. Players coming out of university eligibility are ready to go pro at different times, depending on graduating in December or May. How you handle the months of your year will vary depending on if you are already signed and with your team or not signed with anyone yet. The first section of this post will deal with "When you are signed," and the second section of this post will give advice for what to do "When you are not signed yet." February is a short month, but it can feel like a long, cold part of dark winter in some parts of the pro world! It is so important during February to fuel your passion for your sport and remind yourself of your purpose, both on and off the court. You have at least two to four months of your season left, and you want to make sure you are still getting better and better! For the sport of Women's Volleyball in 2016-2017 (can also see Men's Volleyball at this link), there were over 440,000 girls playing in high school. There were over 21,000 American women playing in around 1,200 teams in the top four levels of college volleyball. These numbers can vary slightly from year to year, but, in general, they will maintain that each team has about 15-18 players and the same percentage that roughly 5% of USA high school players will continue to play in university. If we figure even just 20% of these players are graduating seniors, that means at least 4,000 USA volleyball players will no longer have their college teams to play on after each season. I have known many pro players to have careers lasting into their late thirties, but, for the sake of averages and easier math, let's say all of these annually graduating players could physically compete at some level abroad from ages 23 to 33, for 10 years. In January of 2018, USA volleyball set a record for the MOST transfers it had EVER had: 413. This included both women (307) and men (106). The current list for the 2018-2019 season is here. There will be another update posted during this month with the mid-season transfers added. These lists are really helpful because you can find players you know and to follow on social media, learn about team names and countries, and notice which places and levels take which kinds of players. If you're already an American female volleyballer abroad, you can gain a lot of confidence and purpose in the fact that you are part of the barely .08% of able-bodied players your age still getting to enjoy the game as a player (and in the .0007% of the girls you played with and against in high school)!!! For whatever pro sport you are playing or hoping to play, the percentages are nearly the same! Be proud of what you have accomplished and what your goals are, and be passionate about the gift of playing your sport! Every month of your year can be outlined with a theme, enhanced with motivational reminders, and structured in a way that you day-to-day activities promote your short and long term growth and well-being. Create a 2-3 minute highlight video on your best skill. Link on CV and upload to social media to be shared. Consider your current situation and your thoughts, ideas, and goals for the next season. The club should schedule a meeting with you about the next season; if they do not schedule it, take the initiative to arrange this meeting for yourself. Make sure your representation is aware of the time and date and ready to support. Do a mid-season update with your representation about expectations from both sides for next season. Plan your summer training, travel, work, and living situations. Do your research as best as you can. Contact current and previous pro players. Contact agents and agencies to find the best fit for your goals. Learn about different leagues, levels, and countries. Read Navigating Sports Abroad blog post. Read Play Abroad 101 for the most accurate preparation in print. Create your pro sport brand social media platforms, while also tightening up your social media image from the past (any inappropriate/upsetting/unnecessary comments, photos, videos, etc.). Dedicate a Google Drive folder to your documents, photos, and videos, so you can easily attach and link your information to teams. Build your CV (player resumé) to show your basic data, playing history, accomplishments, and video. Make sure you are working out and practicing your sport at the highest level possible on a regular basis AND getting video proof by recording and uploading the full session or highlights. If you've already done these things based on the January post, then February can be spent maintaining your social media presence, widening your contact network through the pro transfer lists, and getting closer to making decisions about who you want to work with and where you want to be. If you looking to join a team immediately, please see this post for resources.